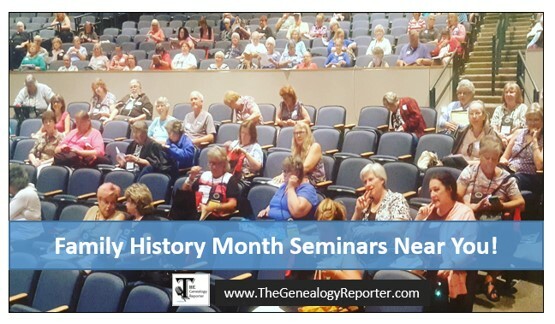 October is Family History Month and it seems everyone is offering amazing genealogy seminars, conferences, and workshops. Which ones will you be attending? Check out the list of Family History Month seminars to see just a few of the top-notch classes you can attend. This 2-day event will be held at the State Historical Society of Iowa, 600 E. Locust St., Des Moines, Iowa. You can register for the event, here. This Saturday, The Genealogy Reporter, Amie Bowser Tennant will present “Rooting Out Your Native American Heritage” at the Park Shopping Center Branch of the Clark County (Ohio) Public Library, 1119 Bechtle Ave., Springfield, Ohio. This lecture is free and open to the public, no registration is required. You Only Have a Death Announcement – Now What? A Gift of Legacy: Who’s Writing Your Story? This event will be held at Christ United Methodist Church, 3440 Shroyer Rd., Dayton, Ohio. To register and pay online, click here. Katherine R. Willson of the Virtual Genealogical Association and the mastermind behind the Genealogy on Facebook List will be the featured speaker at this year’s fall genealogy workshop in Greenville, Ohio. Doors open at 8:30 a.m. at the Garst Museum, 205 N. Broadway, Greenville, Ohio. Pre-registration for this event has passed, but you can register at the door for $25.00. 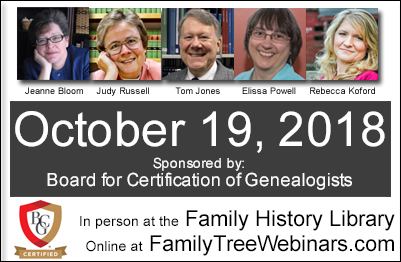 Family Tree Webinars is sponsoring an all-day event with some of the brightest genealogists in the field. Live at the Family History Library in Salt Lake City and online at Family Tree Webinars, you can enjoy these webinars for free. Learn from leading certified genealogists in the field, Jeanne Bloom, Judy Russell, Tom Jones, Elissa Powell, and Rebecca Koford. 9:00 AM MST (Mountain Standard Time) – “Past Conflict Repatriation: The Role of Genealogists & Methodology in Fulfilling Our Nation’s Promise,” presented by Jeanne Bloom, CG. 10:30 AM MST – “Deeper Analysis: Techniques for Successful Problem Solving,” presented by Elissa Scalise Powell, CG, CGL. 1:00 PM MST – “John Jacob Kramer: Case Study of Mistaken Identity among Revolutionary War Soldiers,” presented by Rebecca Whitman Koford, CG, CGL. 2:15 PM MST – “Using Indirect and Negative Evidence to Prove Unrecorded Events,” presented by Thomas W. Jones, PhD, CG, CGL. 3:30 PM MST – “The Discriminating Genealogist: Telling Good Evidence from Bad, ” presented by Judy G. Russell, CG, CGL. Certified Genealogist is a trademark and CG is a service mark of the Board for Certification of Genealogists, used under license by board-certified associates after periodic competency evaluations. Pre-registration runs through 17 October or tickets can be purchased at the door. For more information and a registration form, click here. Louisville Genealogical Society hosts Dr. Michael Lacopo and Debra Renard for their Family History Month Seminar and Book Fair. This all-day event will be held at Holiday Inn Louisville East – Hurstbourne, 1325 South Hurstbourne, Louisville, Kentucky. To learn more and register for this event, click here. Registration price before 14 October includes lunch, so be sure to register soon! Saturday, October 27, 2018, 10:00 a.m. – 3:30 p.m. The Indiana State Library will host the annual Indiana Genealogy and Local History Fair in downtown Indianapolis. Admission is free and open to the general public. This year’s theme is “Digging Up the Dead,” how to examine, decipher, and interpret death records, death research, and other interesting facets of mortality in history. Highly acclaimed, internationally known speakers and genealogy consultants, Lisa Alzo and Amie Bowser Tennant, will present. In addition, Sarah Halter, Executive Director of the Indiana Medical History Museum, will give a brown bag lunch lecture. Over 30 organizations and exhibitors will be in attendance. See the full schedule of events, here. For more information and registration, see the website here. There is an easy and quick way to learn what’s happening in your neck-of-the-woods. Pop over to Conference Keeper! 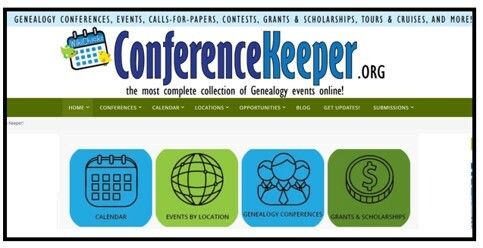 This website allows you to see genealogy events, call-for-papers, contests, scholarship information, and more. Just search by location to see all the events happening around you. Have a great Family History Month, friends! The Genealogy Reporter has entered into an affiliate relationship with Family Tree Webinars. Clicking on some of the links in this article may result in a commission being paid to The Genealogy Reporter at no additional cost to you.